Neptune™ | Strobes & Beacons | Adams Industries, Inc. 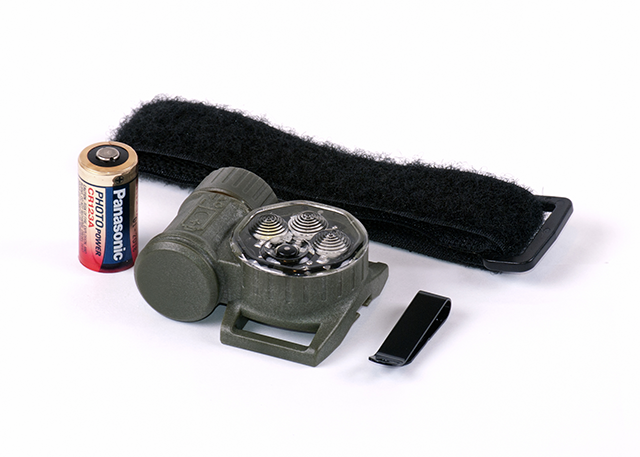 The Neptune™ (NSN: 6230-01-618-0393) beacon is a multi purpose multi function signal light developed to provide the soldier and officer several ID and illumination tools in one compact package. The Neptune light produces a wide, variable-output, flashing or constant on, IR, Blue or White signal. In flashing IR mode, the intense brightness of the Neptune's signal allows it to be used as either an individual or vehicle Combat ID marker. In Blue or White signal mode, the beacon can be used as either a land or water distress signal. Despite its small size, all Neptune functions can be controlled with one hand even when gloved. The Neptune's signal is turned ON or OFF simply by rotating the battery cap. The single mode selection button allows the user to select light color and move between flashing or constant on signal mode. Brightness level can also be adjusted in constant on mode, making the light useful as either a signaling device or lamp. The Neptune can be attached to PALS webbing, belts, or uniform by using the supplied locking spring clip or wrist mounted with the included wrist strap.